With the Block Town Building Toppers - Set of 10 available from Discount School Supply, you'll have the best block set on your block! Review: "So excited to see this toy as a great imaginative accessory to block and car cities, dollhouses, etc. Paint is nicely done; does not smell toxic. Like that there is variety of topper shapes, colors, and that the destination shows both picture and word. Great unique birthday gift that will last for many years for both boys and girls." Add a colorful new look to your block city with this set of 10 hardwood Building Toppers. Designed in scale with standard unit blocks, these 5-1/2"L x 1-1/4"W x 3"H painted blocks bring to life the community locations little builders create. 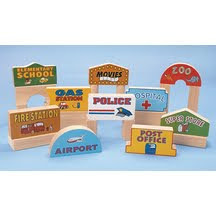 Get your Block Town Building Toppers - Set of 10 today right here or at Discount School Supply! Exclusively ours.